If you own Ipad and perhaps Iphone too, I bet you definitely save photos or pictures that you like while your browsing the web. The bad thing is the iTunes won’t synch up these “saved” photos by default. What you need to do is manually copy over to your PC. Browse to “\Internal Storage\DCIM\800AAAAA” and all your saved images from Ipad should be there. Just copy or cut and paste to your local drive. How to Upgrade Jailbreak IOS version? When you first jailbreak you iPhone, iPad or iPod, the next thing that you want to worry is how to you upgrade to the latest IOS version. For example, how can you upgrade IOS version to 4.3.2 since your previous jailbreak IOS version is 4.2.1? You need to do research before you upgrade your jailbreak IOS. You may not need to upgrade at all or else you will only upgrade for troubles! Go to iClarified and check for whether the “untethered jailbreak” IOS version is available for the latest IOS version that you plan to upgrade. If the website doesn’t have a warning stating the the current jailbreak version is the tethered jailbreak, then it is the untethered jailbreak version. If “untethered jailbreak” is available for your IOS version that you plan to upgrade, you can now upgrade your IOS version. If no, just stick back to your original jailbreak IOS version and wait for the “untethered jailbreak" IOS version release. Note: If you don’t know what is tethered vs untethered jailbreak, read my previous post: Should I Jailbreak? Unfortunately, you can’t upgrade your jailbreak IOS version directly. You need to upgrade to the original IOS firmware and perform the jailbreak process again. Here I list down the steps to upgrade your Jailbreak IOS version. 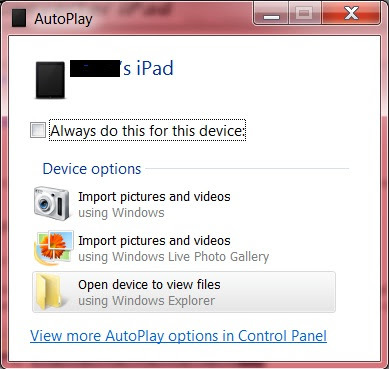 Connect your iPad, iPod or iPhone to your PC. Turn on your “itunes” if it is not automatically run. Click on “Check for Update”. Follow on-screen instructions to upgrade your IOS version to the latest release. Perform jailbreak on the latest IOS version that you have – See my previous post for instructions how to jailbreak: Should I Jailbreak? Note: If there is problem with step (2), try to click the “Restore” and follow the on-screen instructions to update to the latest IOS version. If it still doesn’t work out (e.g. the iTunes gives you an error “Fail to Update the Firmware”), what you need to do is to re-jailbreak your iDevices again with your original IOS version. After that, perform step (1) and step (2). It works for me. In short, just upgrade only when the untethered jailbreak version is available or else just wait for it. To upgrade, you must upgrade to the original firmware and perform the jailbreak again. Good luck!